I make NO claim to this recipe. 1. Cream the butter with the handheld mixer until soft and fluffy. 2. Add both sugars and mix, then add the vanilla and 1 egg and mix, then, add the remaining egg and mix. 3. Add the flour, baking soda, and salt and mix. 4. Using your hands, roll the dough into a long thin rope; then cut into small bits. 5. Refrigerate until ready to use. 1. Cream the peanut butter, sugar, salt, and vanilla in a large bowl until smooth. 2. Add 1 cup of half-and-half and beat until well mixed. Add the rest of the half-and-half and whisk. 3. Pour the mixture into ice cream maker and process for 25 minutes. 4. Add in the cookie dough a few pieces at a time. Let the ice cream churn for another 5 minutes. 5. 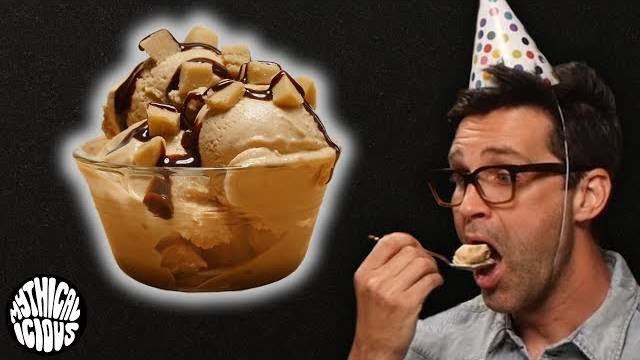 Freeze the ice cream for 1 to 2 hours before serving. I received this recipe in a book email from Ali Parker, and instead of holding onto the email forever, I'm posting it here. This is *NOT* my recipe, and I make NO claim to it. 1. Preheat oven to 350℉. Grease a 9×9-inch pan with cooking spray. 2. Spread cookie dough in an even layer on the bottom. 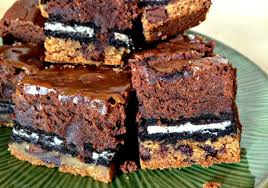 Top with Oreos in an even layer. 3. Mix brownie batter according to package instructions; spread on top. 4. Bake for 40 to 45 minutes, or until a toothpick inserted into the center comes out clean. 5. Let it cool in the pan for 15 minutes before cutting into 16 even squares. I received this recipe in a freebie pack of Sweet’N Low® zero calorie sweeteners. I'm finally getting around to posting all the backed up recipes I have. 1.Pour boiling water over tea bags in 1 1/2-quart nonmetal heatproof pitcher. Steep 3 minutes. Remove and squeeze tea bags. 2. 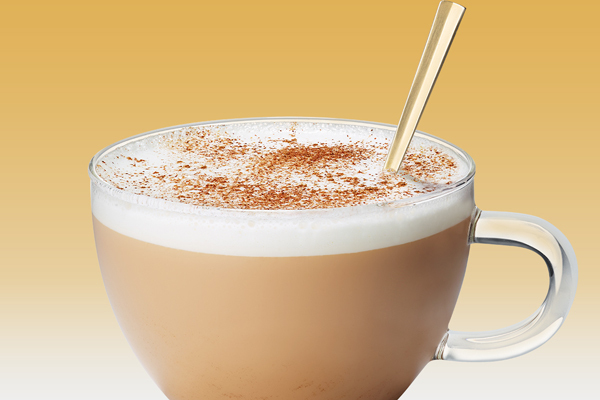 Stir in Sweet’N Low®, pumpkin pie spice, cardamom, pepper, vanilla and skim milk. 3. Sprinkle individual servings lightly with additional pumpkin pie spice. Tip: If desired, top each serving with a little whipped cream topping from an aerosol can. TO MAKE WITH NORMAL SUGAR: Replace the 12 packets of Sweet'N Low with 1/2 c sugar. Make as directed. I got a booklet in May's Love with Food box from Schar, and this recipe was in the booklet. Before I toss the booklet, I figured I'd post the recipes. 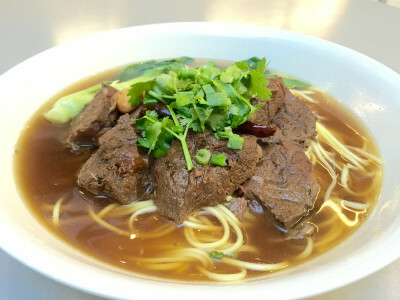 FROM THE BOOKLET: This delicious noodle soup is inspired by the traditional Vietnamese dish simply known as "pho." 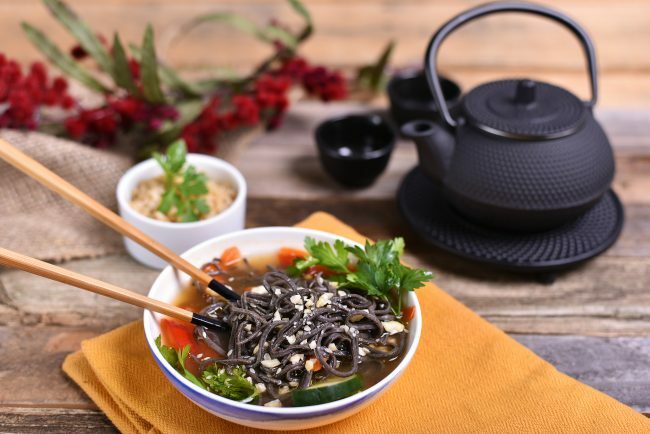 Far from the likes of canned soup, this homemade pho delivers a comforting, warming blend of better-for-you ingredients, including fresh, crisp veggies, tasty broth and slurpable black bean noodles. 1. Place the bread in the toaster and lightly toast. Place the toasted seeded loaf on a plate and cut the toast in half diagonally. 2. Thinly slice the bananas and lay the slices on the toast to cover the top, drizzle with the lemon juice. 3. Scatter the chopped walnuts and chia seeds over the top. 4. 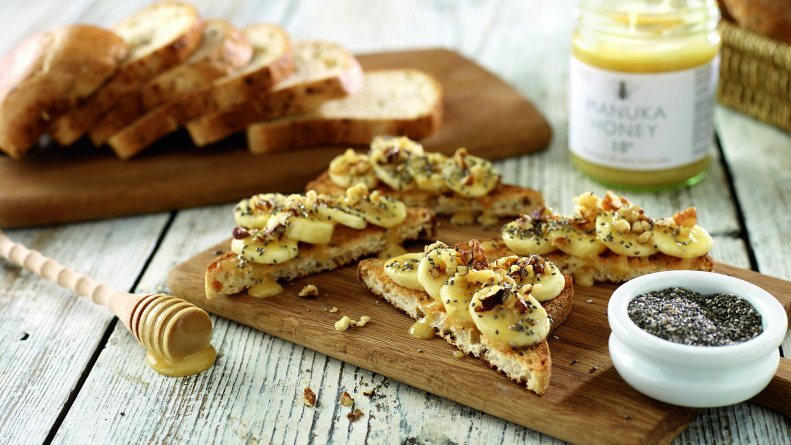 Drizzle with Manuka honey to sweeten. You can also add peanut butter to hold the banana slices on the toast and for sweetness. I got a booklet in March's Love with Food box from Vitacost, and there were some recipes in the booklet. Before I toss the booklet, I figured I'd post the recipes. 1. In large pot, bring broth to boil. Add noodles and cook according to package directions. 2. In saucepan over medium heat, coat with oil and add ginger and garlic. Cook 1 minute, stirring constantly. Add stock and soy sauce; bring to boil. Simmer 10 minutes. 3. In bowl, mix carrots, bell pepper and cucumber. 4. To serve, distribute noodles evenly among four serving bowls. Top each serving with 1/4 vegetable mixture. Pour about 3/4 cup stock mixture into each bowl. Sprinkle evenly with sesame seeds, cashews and herbs. *If you cannot find these brands locally, you may substitute for other brands or buy them directly from vitacost.com. FROM THE BOOKLET: Your morning mash-up is missing something. It needs a good blast of body-loving nutrients, which conveniently come blended into one powerhouse powder. The mix of flax, superfoods probiotics and herbal extracts is in one full stop. All you have to do is pour it in and shake it up! 1. 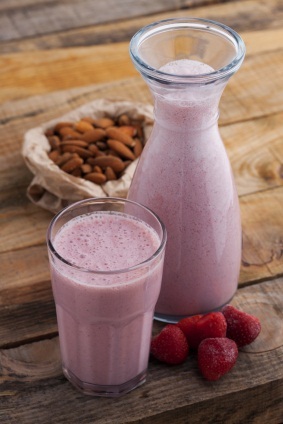 In a high-speed blender, add all ingredients in the order listed and process until smooth. 2. Top with extra coconut, if desired. Lasagna was a FAVORITE of mine as a child. I thought my mom made the BEST lasagna ever. I actually thought my mom was a pretty good cook. I loved a LOT of her dishes. Sadly, I don't remember the recipe to my favorite dish she made... but I do remember it involved boneless chicken breasts and Campbell's Broccoli Cheddar cooking soup. Lasagna has now become a 'birthday dish' in our house; Grandma makes it every year for Mama Melissa's and her birthday (Yes, they share a birthday), and this year, Grandma used the box of Delallo Gluten Free lasagna noodles I got in January's Love With Food Gluten Free box. This recipe was in the same box. 1. In a medium non-stick pan over medium heat, sauté the beef and veal until cooked through, breaking up meat with back of spatula, about 8 minutes. Remove the meat from the pan and allow to cool. Mix the browned meat with the marinara sauce in a bowl. 2. Preheat oven to 350˚F. Combine ricotta, 3/4 cup Parmigiano and parsley in a bowl. Season to taste with salt and pepper. Mix in eggs. 3. Spread 1/2 cup sauce over bottom of 13 by 9-inch baking dish. 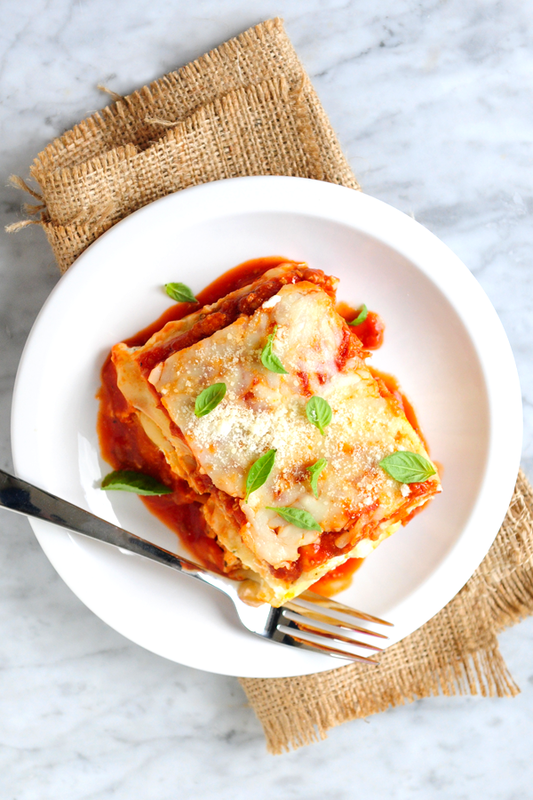 Place cooked lasagna sheets over sauce, overlapping to fit. Dollop half of ricotta mixture evenly over the sheets. Sprinkle 1/2 of the mozzarella cheese evenly over ricotta mixture. Then, spoon 1 1/2 cups of sauce over cheese, spreading with spatula to cover. Repeat layering with remaining lasagna sheets, ricotta mixture, mozzarella and sauce. 4. Top the final layer with remaining sauce and Parmesan. Cover the baking dish with aluminum foil and bake for about 45 minutes. 5. Uncover, then bake until hot and bubbly, about 10 minutes. 6 Let lasagna stand 10 minutes before serving. So, I failed at this SO bad. I have no excuse other than my other two blogs, The CP Chick and Becky's Book Bytes took off and have kept me busy. I plan to start posting more regularly here. I have some recipes from some of the review boxes I receive for The CP Chick, and I plan to post them before I toss the papers from the boxes. 1. It's easy to make. I got a card in my November 2016 Love with Food Gluten Free box with this recipe on it, so before I tossed the card, I wanted to post the recipe. 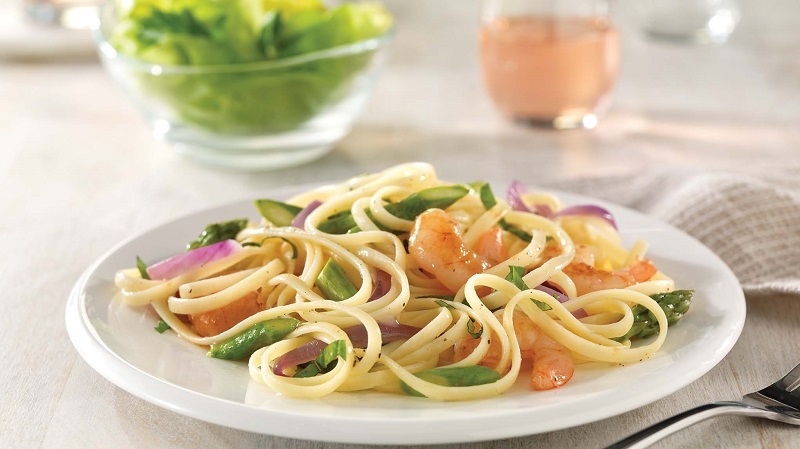 This recipe is using Barilla® Gluten Free Fettuccine, but I think ANY brand of fettuccine can be used. 1. Bring a large pot of water to a boil; cook pasta according to package directions. 2. Meanwhile, in a large skillet, sauté onion in olive oil for 2-3 minutes or until slightly browned. 3. Add asparagus and shrimp; cook for 2-3 minutes or until the shrimp are browned on both sides, then season with salt and pepper. 4. Drain pasta, add to skillet and toss with the sauce. Remove from heat, fold in basil and serve immediately. Growing up, I hated pumpkin ANYTHING. My Holiday Pie choices were Apple and that's it. I didn't want any other pie, and while my older family members would scarf Pumpkin Pie down, I refused to even try it. I'd say I was well into my teenage years when I tried Pumpkin Pie for the first time... and that was it. I was hooked on it. I got a coupon card in my November 2016 Love with Food Gluten Free box with this recipe on it, and with Thanksgiving coming up soon, I wanted to post it. 2. 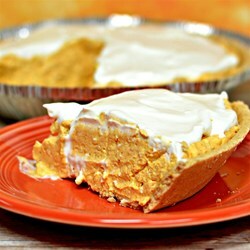 Using an electric mixer, beat cream cheese, sugar, pumpkin, and pumpkin pie spice until smooth and creamy. 3. Add eggs, one at a time, beating well after each additon. 4. Pour batter into homemade or premade crust and bake for 40 minutes. 5. While the pie is baking, melt the white chocolate chips and 1/4 c heavy whipping cram in a small saucepan over low heat, whisking constantly, until mixture is smooth. 6. Pour into a bowl and refrigerate until mixture thickens and cools, about 30 minutes. 7. Using an electric mixer, beat remaining 3/4 c whipping cream to soft peaks. Add sugar, extracts and spices and continue to beat until stiff peaks appear. 8. Mix 1/2 of whipped cream into white chocolate mixture, stirring until fully incorporated. Gently fold in remaining whipped cream. 9. Pipe or spoon onto cooled cheesecake. I got this recipe in last month's Love with Food box, and in an attempt to clean up my work area, wanted to post it, so I can toss the card. 1. 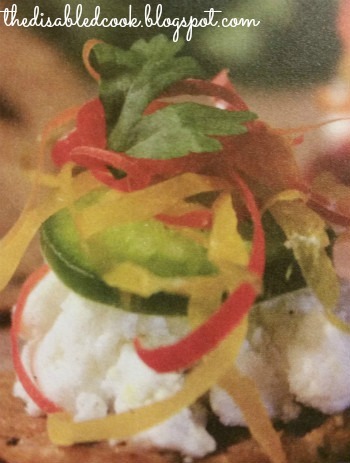 Start by using a Julienne peeler to create strips of cucumber and bell pepper. The thinner the strip, the better for making them curl on the top of the tower. 1. Soak wooden skewers in water while prepping (for at least 30 minutes). 2. Cut the chicken, peppers, onions and mushrooms into 2-inch cubes. 3. Place in a bowl or large resealable container and pour in the Veri Veri Teriyaki sauce (leaving some for basting). Turn until everything is evenly coated. 4. Let ingredients marinate for at least 15 minutes. 5. When it’s ready, discard any leftover marinade. 6. Prepare a charcoal grill for direct cooking over medium-high heat. 1. Thread the chicken and vegetables onto the skewers. 2. 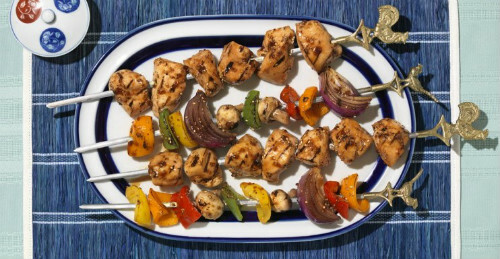 Place the skewers on the grill, turning frequently until chicken is cooked through and browned on all sides. 3. Brush with additional Veri Veri Teriyaki sauce for more flavor. I wanted to make some more of the Poor Man's Tuna Noodle Casserole I posted last week, but I couldn't find the other can of tuna I had. But, If Mama Melissa taught me anything about cooking, it's how to improvise on the fly. So, I used a can of the pre-cooked chicken breast I usually use for my chicken salads. It tasted even better! 1. Cook noodles according to package directions and drain; return to pan. 2. 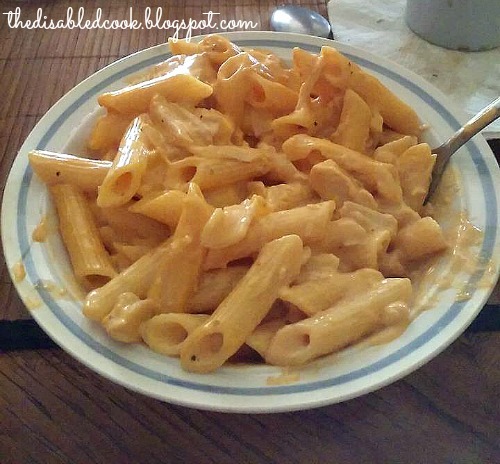 Pour cheese sauce over noodles and mix well. 3. Add can of chicken and mix well, chopping the chicken as you mix. 4. Return pan to low heat for 5-6 minutes or until thoroughly heated. Add spices and continue to mix well. This makes 1 serving. Adjust amounts for more people as needed. You may use other spices as desired. I just used what was within reach above our stove. *You may change or omit the chicken as desired. As I said, I was originally aiming for some more Poor Man's Tuna Noodle Casserole, but had to improvise. You can use chicken, turkey, ham, beef... even veggies if meat isn't your thing! You can also use fresh meats. I just use canned meat, because it's easier for me to use. This recipe was born from the desire to figure out what to do with a package of penne noodles I got in a review box, and a 1/2 jar of leftover cheese sauce. 3. Add can of tuna and mix well, chopping the tuna as you mix. 4. Return pan to low heat for 2-4 minutes or until thoroughly heated. Add spices and continue to mix well. This makes 2 servings, or one 9" plateful. Adjust amounts for more people as needed. I got this recipe for a subscription box I am in the middle of reviewing on my other blog, The CP Chick. I really didn't want to include the recipe there, but I didn't want it to go to waste either. The traditional way to prepare this would be to use Asian egg noodles, but any 'long' noodle could be used in a pinch. 1. Blanch the beef in boiling water for 5 minutes, to remove extra fat and blood. Cut into pieces. 2. Heat up a pot. Add oil, all spices, and beef. Stir fry until everything is coated. Then add 4 cups of water and boil on low heat for one hour. 4. Garnish with green onions. 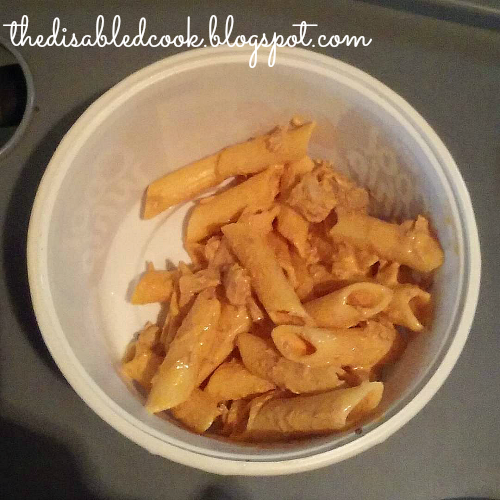 I'm 37, disabled with Cerebral Palsy, Loves to cook and try new recipes. This blog will be my personal 'stash' of recipes that either are tried and true or I WANT to try... but instead of being selfish, YOU can try them too! So, feel free to follow along, and if you DO try a recipe, let me know! !